If you have been diagnosed with sleep apnea, you have likely been introduced to at least one of the possible treatment options. The most common (and effective) therapy is continuous positive airway pressure (CPAP). You may also be curious to know the difference between two similar treatment options: CPAP and BiPAP (or bilevel) therapy. In addition, what is ASV (adaptive servo-ventilation) therapy? Discover more information about these therapy device types and which one might be right for you. What Is CPAP Therapy for Sleep Apnea? The standard treatment for obstructive sleep apnea is the use of a machine that provides support to keep your airway open while you are asleep. This can be accomplished with continuous positive airway pressure (CPAP) in which a constant flow of pressurized room air is provided via a face mask. There are also portable travel CPAP devices available. How does CPAP work to treat sleep apnea and what pressure is needed? The pressure setting of this airflow is often determined by a doctor based on your needs. This may be evaluated as part of sleep study or can be estimated based on your risk factors, such as your anatomy and weight. An effective pressure setting is meant to prevent both apnea and snoring and should reduce the apnea-hypopnea index (AHI) below five, as well as improving the other symptoms associated with sleep apnea. An associated type of therapy is AutoCPAP, or APAP, in which a range of pressures are provided by the device. If resistance in the upper airway (at the level of the soft palate or base of the tongue in the throat) is detected, the pressure delivered will self-adjust within a prescribed range. 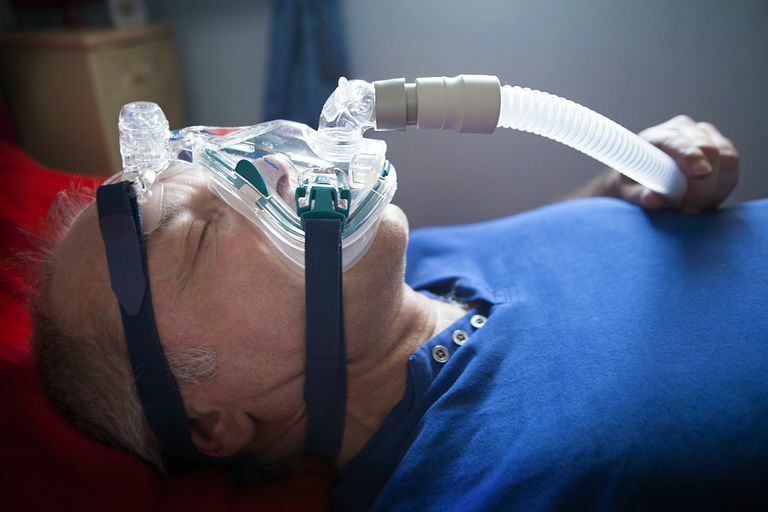 What Is BiPAP or Bilevel Therapy for Sleep Apnea? A similar therapy is called bilevel, or BiPAP, but it differs in important ways. BiPAP is an abbreviation trademarked by the manufacturer Respironics for bilevel positive airway pressure. (It is called VPAP by the other major manufacturer, ResMed.) The "bilevel" component refers to the fact that there are in fact two pressures, which the machine is able to alternate between. This allows you to breathe in with a higher pressure and breathe out against a slightly lower pressure. This may help those who are struggling to acclimate to CPAP. It may improve air swallowing (called aerophagia). It may also help with claustrophobia. Bilevel may be required when pressures are higher to improve comfort, especially at PAP pressures that are 15 cm of water pressure or higher. Aside from a label or different color, from the outside, the machine may not look significantly different from a CPAP. It still requires the same tubing and face mask that is used in CPAP therapy. However, it can be more effective in select circumstances, such as those described above. Do I Need CPAP or BiPAP to Treat My Sleep Apnea? People with the most common form of obstructive sleep apnea usually start treatment with CPAP or AutoCPAP. It should be noted that bilevel, or BiPAP, is more often used to treat central sleep apnea. This condition is characterized by pauses in breathing without obstruction of the airway and is identified as part of a sleep study. It may occur more often in people who have had heart failure, a stroke, or in those who chronically use narcotic pain medications. It can sometimes be caused by CPAP itself, but this rarely persists beyond the first few months of use. The BiPAP device may be set to compensate for these pauses in breathing by kicking in an extra breath as needed. Some devices are quite sophisticated, varying the airflow that is delivered to compensate for respiratory and neuromuscular disorders that affect breathing as well. These disorders include chronic obstructive pulmonary disease (COPD), amyotrophic lateral sclerosis (ALS), and other conditions. Are There Other Machine or Setting Options? Beyond CPAP and BiPAP, there are additional settings of the machines that can be ordered by your sleep specialist. Many machines, often with the prefix "Auto," have an automatic feature that allows a range of pressures to be used. Auto devices can be of both the CPAP or bilevel variety. The device is able to respond to subtle collapses in the airway and can turn up the pressure as needed during the night. This may be helpful if sleep apnea worsens due to changes in sleep position (such as lying on one's back) or due to REM sleep causing increased events. There is also a type of bilevel that can deliver timed breaths (often called bilevel ST). This can ensure that a minimum number of breaths per minute are occurring. This may be important in central sleep apnea. Finally, there is another sophisticated machine called auto or adaptive servo-ventilation (ASV) that has even more features to maintain normal breathing in sleep. It can vary the volume of air delivered as well as the speed at which the lungs are inflated and deflated, among other settings. These devices are often reserved for people who need extra ventilatory support due to underlying neuromuscular, cardiac, or pulmonary diseases. How do you sort this out? Luckily, you don't have to! Your sleep specialist should be able to make the proper determination of your therapy needs based on the results of your sleep study and your assessment in the clinic. Discuss your options at your visit and be in close contact if you experience any difficulties with the treatment of your sleep apnea. Based on usage data, if changes in your therapy are required, these can be arranged when you are seen in routine follow-up. It is sometimes necessary to arrange a titration study in which these various modalities can be explored in a controlled fashion. Cao, MT et al. “Continuous positive airway pressure therapy in obstuctive sleep apnea: benefits and alternatives.” Expert Rev Respir Med. 2017; 11(4):259-272. Freedman, N. “Treatment of obstructive sleep apnea: choosing the best positive airway pressure device.” Sleep Med Clin. 2017;12(4):529-542.